Home » Hellgate:London goes Live! Randomization: Hellgate:London builds heavily upon the core design of roguelikes by using random generation of maps, monsters, and loot to allow for a high degree of replayability. Multi-Perspective: Hellgate:London can be played in either a third or first-person view. Melee classes default to a third-person view, whereas ranged classes default to a first-person view. Subscription: Hellgate: London can be played offline or online without a fee. Players can pay a monthly fee to gain additional content over time, including new areas, weapons, monsters, classes, quests, events, titles, game modes, and many other perks. Some of these perks will be available to non-subscribers as well, eg. auction houses. Ate Issai‘s wait is over. Bill Roper gives his thanks to everyone on the project as well as those awaiting it. We want to say THANK YOU to all of the wives, husbands, boyfriends, girlfriends, families and significant others that have supported our crazy endeavor. Your understanding and encouragement over the past four years has been appreciated in ways we can’t properly express. We also want to offer some special thanks to our publishing partners all across the world. You took a risk on us and our idea, and you’ve been supportive of our design philosophies and our development processes. In an atmosphere of, “ship at any cost” you encouraged us to take the time we needed to achieve our goals and make Hellgate: London the best game we could create. 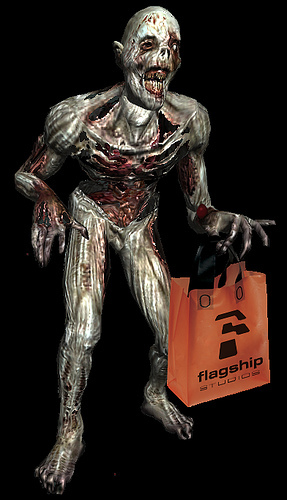 And finally, I want to express my gratitude to all of the people at Flagship Studios and Ping0. What started out with a single, high-level idea has grown into a project and companies that are grander than anything we could have envisioned. The people that are here comprise the best teams I have ever had the honor to work with. And the passion and dedication and pure sweat they have poured into making this release a reality is second to none. Thank you all for your unwavering commitment. So, enough jibber-jabber! Let’s play some Hellgate: London! We hope you have as much fun playing the game as we’ve had making it. Subscriptions are temporarily unavailable due to technical issues. You are still able to create accounts and all players will be able to subscribe as soon as this is resolved. For users who have had difficulties subscribing, we are investigating these issues and will attempt to resolve them as soon as possible. Note that these specs are still subject to change since they are the minimum recommended system specs for Hellgate: London Beta. Over time, as optimizations are made and the game nears completion, revised specs will be released. For More info on the game head to the Hellgate : London’s official site or Hellgate Guru. If you want to create an account now, use this link. You a promo code or an activation code (on the back of the case) to do so however. Problem 1 : Hellgate London Mouse Sensitivity is too slow or unreactive in first person mode. Solution 3 : Set the in-game sensitivity and Windows mouse sensitivity to high-low or low-high. Solution : This error occurs for beta players who didnÃ¢â‚¬â„¢t get the latest beta update before moving on to the retail. Uninstall your current Hellgate London and Hellgate London beta installation and download the new one or reinstall from the disc. Problem 4 : I have the retail Version of Hellgate: London, and all the characters are highly transparent/translucent/see-through. How do I change this? Solution: Using the Nvidia control panel, under 3D settings there is a setting called Ã¢â‚¬Å“Antialiasing – TransparencyÃ¢â‚¬Â. That setting has three options: Off, Multisampling, and Supersampling. Turn this setting to Ã¢â‚¬Å“OffÃ¢â‚¬Â. Solution : If you run the program with the compatabilty ioptions as XP sp2 it works just fine. Problem 6 : Hellgate London Ã¢â‚¬Å“Error reading frim fileÃ¢â‚¬Â¦Ã¢â‚¬Â and disc reading errors. Problem 7 : Hellgate London Sound Problems / no Sound in Hellgate London.